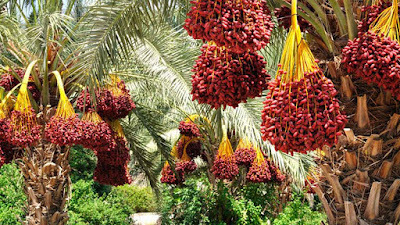 Dates (Phoenix dactylifera L.) is a palm-type tree that produces dates which is one of the staple foods in the Middle East region. The young date palm has a yellowish red color and after dark brown color depending on the type with the length of each fruit between 3-7 cm and the diameter between 2-3 cm. Date palm has a sweet taste with a single seed in it. Date palms have a high tannin content that is very useful for cleaning the intestines from blockage of dirt.